The automobile, like good champagne, improves by stages, year after year, the car’s derivative advancement ever keeps on improving. However, I did not begin this to discuss the monstrous automobile as we know it today but the way of life with owning a car in the good old days. The automatic starter (self-starter) was not standard equipment in cars for many years. Neither was the gear shift, speedometer, water pressure, gas gauge or the combustion motor. Few, if any, drivers bothered to obtain a driver’s license, insurance, or car tags. Probably such things were mandatory, but there were such few cars on the road and yet fewer road patrolmen to enforce the highway laws. Speeding certainly was no problem, neither the car mechanism nor the road surface would permit such hazards. State revenue on cars was too sparse to be of much interest to the capitalist bureaucracy which left the car owners pretty much to themselves. I was too young and unsophisticated to know much about cars, even though I learned to drive a T-M Ford coupe before I was sixteen. 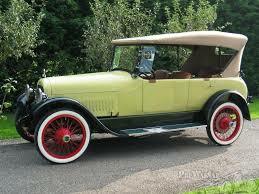 My boy friend bought a second Model-T. I, being his favorite girl friend, he insisted upon teaching me to drive…few women drove cars then. The automobile was as clumsy and hard to manipulate as a “Mongolian War Wagon”, certainly nothing a lady cared to wrangle with. I suppose I didn’t consider myself to be a lady. John and I drove outside city limits off into a farmer’s cow pasture. There, in an Ohio cow pasture, I learned to drive my first car. I was so proud of my new achievement and my boy friend. I married the guy a few years later. I think my girl friends at old Hamilton high were a little bit jealous of me when they saw me driving a car. The suave electric Broughams were designed with women in mind. They were a short-lived car; their driving performance was limited to paved street and they cost a lot; only the rich could afford them. 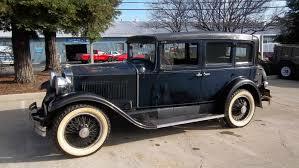 It was around 1914 when installment financing of cars began to become a common factor, like buying sewing machines. Still, financing anything then was not a popular thing to do; going in debt for such unreliable luxury was the height of impracticality, although it was becoming a way to passive ownership to the young and adventurous. 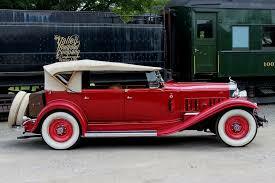 The late Will Rogers said: “There ought to be a law to force all cars off the road until they are fully paid for. It would greatly relieve the traffic congestion.” If Will could travel along our six-lane freeway today! Gasoline stations were sparse; few carried tires and/or chains. Gasoline stations were not the roadside flower that blossomed on every block or crossroad. Motorists carried much of their own fuel, oil and spare tires. In fact, service stations did not exist as such; gasoline and oil were bought at general stores or at the few existing garages. Farmers who used gasoline motors to cut wood and pump water usually kept a surplus and advertised on sides of barns or roadside posters where gasoline was for sale. 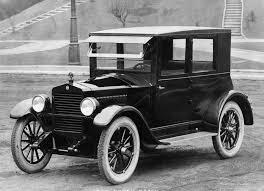 For cold weather, there was a detachable roof…a window like square tent; (an extra sales pitch) “Now you can drive all winter.” Automobiles were usually jacked up in garages or stored during winter moths in the cold climates, reminding the nowadays motorist what a fair weather friend the early cars were. Hudson Motors made the firs permanently joined roof to the body. It was the coupe and the roadster. Hudson was the first, also, to make the sedans. They only cost $100.00 extra over the standard price of a touring car; when driving, you wore duster coats, veils, goggles, had acetylene headIigihts and suffered windburn. Far back as I remember in 1912, my Uncle Jim bought the franchise to become the first Ford dealer on our small Kentucky town. Not long after, a man by the name of Kackney bought the franchise to sell Hupmobiles right across the street. ‘Twas then the battle of the “brag” began as to which car outbested the other in endurance, speed, mechanical breakdowns, repair. It is interesting to note, the old Hup has long vanished from the highways, but the Ford still hangs in there, more powerful, more beautiful, more elegant and outpowering and outdoing all other, both older and newer creations. I can see Aunt Jane now, sitting so proudly by Uncle Jim – her strawhat swatched over and tied under her chin in pink chiffon scarves, her buxom figure securely buttoned top-to-bottom in her long, tan dust coat. Uncle Jim wore gloves, goggles, a billed cap to match his tan dust coat and talked incessantly about the prowess of owning and selling Fords, the noise of the struggling motor chugging along rutty roads, drowning out audio, but such a thing never discouraged him from basting of the mileage, the power, the performance the old touring car showin’. We kids sat proudly in the back seat, taking in the country sights and laughing at frightened horses along the way, glad to be in the car and not in the surrey or with buggy travelers who were also out to enjoy a Sunday drive. Automobiles in the good old days were never referred to as “cars”. 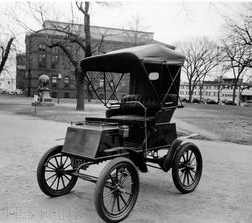 They were advertised as autos, colloquially, as machines, Tin Lizzies (Fords) flivvers, puddle stickers…or jumpers, gasoline buggies, the horseless carriage. Sometimes, when broken down on the road or stuck in a mud hole, they were called names unprintable. The following are quotes taken from a driver’s manual printed around 1910-12. “When approaching a hill, it is often well to rush it if the coast is clear. (Automobile drivers were self-taught.) The horn or the gong should be used freely, although in blasts of short durations. Don’t argue with the trolley cars, express wagons, brewery trucks or other heavy bodies found on the public thoroughfares. Remember the drivers….operate on theory, might is right. The automobile’s reputation being in many places none of the best, it is most important to drive as unoffensively as possible. Thought it may be distinctly humorous to see an elderly person dancing a fandango in front of a car, such which has caused much needless irritation and dislike for the automobile in general. In 1914, there were approximately 100 or fewer automobiles per one thousand population, and this estimate was taken east of the Rockies, more or less, east of the Mississippi River. It was 1916 before the first federal subsidy was granted for road improvement. In 1914, America had only 750 miles of concrete highway. Rain turned other roads into slithering swamps where clay soil all but cast the wheels in dry weather; traction was better but dust was suffocating. Getting lost was inevitable. The Lincoln Highway was planned as America’s first coast-to-coast highway, but west of the Mississippi, it was a hit-and-miss existence of dotted patches on the road map along rutted quagmires which would discourage an adventurous jeep driver. The successful ones made it by the frequent use of tow ropes and neighboring fence rails for levers to pry them out…some carried pennants, bearing names of their hometowns, leaving them by the worst places to give other motorists warning. Emily Post, her sister, and nephew were among some of the first travelers by car to make it successfully across the continent. That was in 1915 to attend the California-Panama exposition. The speed limit was 20 m.p.h. mostly in low gear, they barely made it through, via Raton Pass and Albuquerque. Bridges were scarce. The A.A. kept teams of horses near in a livery stable to insure the motorist a get-through. It took four weeks to go. Rainstorms held them up once for many hours until the rain stopped and until horse-drawn scrapers smoothed over the worst ruts and turned mud into a tedious navigable surface. Mrs. Post and her entourage took great pleasure in pioneering the trip, …”seeing our country for the first time… trains only give outskirts of towns; the automobile drove through them…” Mrs. Post wrote back home. The electric trolley by this time had already retired horses their labor of plodding between tracks; gasoline-powered taxi cabs were also replacing the hackney hacks as gasoline was rapidly replacing haystacks as energy sources. Sanitation in the city became much improved by the absent of litter and excreta being removed from livery stables. Strange as this may sound today, the automobile meant safer transportation for people. At that time, the current rate of motor fatalities per 100,000,000 was less than a tenth of those caused by kicking, bucking, runaway horses. My grandfather-in-law was killed while training a horse; a great-aunt of mine as a bride and her groom were killed on their honeymoon by a runaway buggy.